Alongside the announcement of UFC 127 headliner, a new batch of fighters slated for UFC 127 became official today. 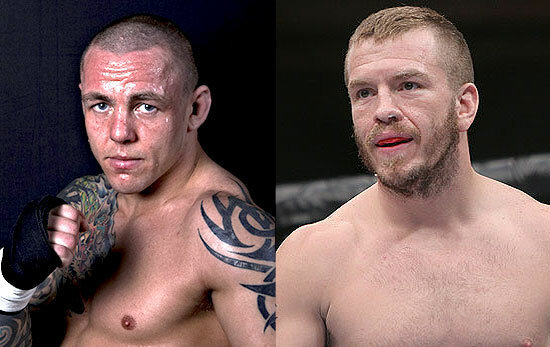 Joining BJ Penn and John Fitch, they will compete at the Acer Arena in Sydney, Australia on February 27, 2011. Numerous rumored bouts for February 2011’s UFC 127 event were made official today. As reported, the Feb. 27 pay-per-view card features co-headliners of welterweights B.J. Penn (16-7-1 MMA, 12-6-1 UFC) vs. Jon Fitch (23-3 MMA, 13-1 UFC) and middleweights Jorge Rivera (18-7 MMA, 8-5 UFC) vs. Michael Bisping (20-3 MMA, 10-3 UFC). Additional official main-card bouts include lightweights George Sotiropoulos (14-2 MMA, 7-0 UFC) vs. Dennis Siver (17-7 MMA, 6-4 UFC), middleweights Kyle Noke (18-4-1 MMA, 2-0 UFC) vs. Chris Camozzi (14-3 MMA, 2-0 UFC), and welterweights Carlos Condit (26-5 MMA, 3-1 UFC) vs. Chris Lytle (30-17-5 MMA, 9-9 UFC). Plus a Preliminary-card bout include light heavyweights James Te Huna (12-4 MMA, 1-0 UFC) vs. Alexander Gustafsson (10-1 MMA, 2-1 UFC). The only surprising bout was that of Anthony Perosh (10-6 MMA, 0-3 UFC) against Tom Blackledge (10-6 MMA, 0-0 UFC). Perosh lost his two UFC fights last 2006. He came back to the organization earlier this year for UFC 110, which marked the UFC’s Australian debut. But as he was just a late replacement for injured Ben Rothwell, he had suffered a TKO loss to Mirko “Cro Cop” Filipovic. The defeat followed a solid 4-1 run in Australia’s Cage Fighting Championships promotion. This will the fourth time that he’ll be aiming for a UFC win, this one’s against Blackledge, an M-1 vet and veteran of the U.K. fight circuit. Although he hasn’t practiced his skills since August 2009, he’s riding a two-fight win streak with stoppage wins over Tatsuya Mizuno and Enoc Solves Torres. He supervised with a coaching stint with Michael Bisping on “The Ultimate Fighter 10″ and was scheduled to fight at UFC 120 in October, but the fight never materialized due to a string of injuries to him and his opponents. UFC 127 takes place at Acer Arena in Sydney, Australia, and due to the time difference, airs live on Feb. 26 in North America.